Coming down the marble staircase, across the terrace the bride is given to the groom by her father. The different shades of the boguevillias help make the atmosphere more romantic . The lovely colors of the arch that match the bride’s bouquet blend in nicely with the green grass where the guests are seated waiting for the ceremony to begin. The ceremony is conducted in Greek while there is also English translation. The vows are exchanged while the ring is placed on each others fingers. After they are pronounced husband and wife the sound of applause, laughter and cheering can be heard. When the family and friends are finished congratulating the couple there are a series of photos to be taken of this momentous occasion. We spend an hour in the garden area so as to be able to have plenty of time to enjoy the different events that take place. We coordinate a series of photos so your album will be perfect. A few romantic photos of just the couple, followed by the traditional family photos of each side, finishing with a group photo of everyone that was present celebrating your special day. Walking through the rain of confetti the bridegroom make their way down the path to the main staircase where their horse drawn carriage awaits. Similar to traditional Greek weddings the bridegroom is taken through the town centre with a convoy of cars beeping and honking. The odd farmer comes out and shoots his shotgun in the air for all to hear and share in the joy of the newlyweds. Arriving at the beach we take more photos and video as the couple hold hands walking down the shore. Returning by horse and carriage the newlyweds are taken to the reception where their family and friends await. Here there is an opening of champagne, the cutting of the cake and of course the traditional dance for the bridegroom. The video fades away as they live happily ever after. The sequence of events depends on what package you choose. For example, if there isn’t a horse drawn carriage we can go by car to the beach for photos etc. All of the above will be recorded on video if you have chosen this option. Two witnesses will be needed to sign. 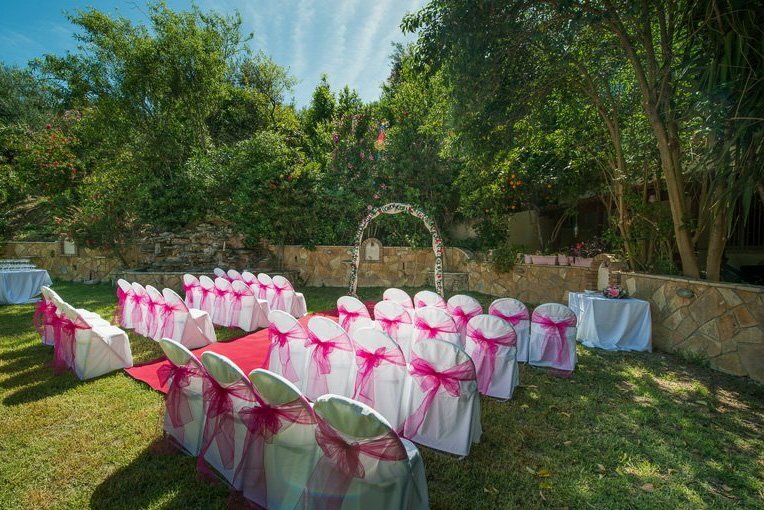 The Garden weddings are the most popular because they are conducted in privacy. The natural surroundings of the flowers blending in with the deep green of the semetric grass gives a natural touch. Having a Garden Wedding allows for the photos to have the best of both worlds. You don’t need to have a beach wedding in order to have beach photos. This type of wedding allows for you to have a variety of backgrounds in your photo album. You can custom make your packages and alter the sequence of events anyway you like as long as it is nothing too extreme. Transport can be arranged for your guests if the locations are not within walking distance.